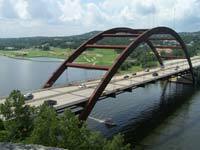 Summary - this is a fun filled 3 days enjoying Canyon of the Eagles on Lake Buchanan, Volente Beach Waterpark in Austin, biking around Town Lake, and swimming in the San Gabriel River. This weekend we committed to babysitting our almost 2 year old grandson - he joined us in everything we did as you can tell by the pictures. 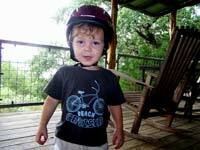 We picked him up in Austin and headed over to Lake Buchanan to spend the night and check out all the good things that we had heard about Canyon of the Eagles. It exceeded our expectations and is a magnificent place to spend a few days. Sitting on a bluff with panoramic views of Lake Buchanan and the surrounding country side, Canyon of the Eagles offers a rustic country lodge. cottage rooms, 14 miles of trails on 940 acres of some of the best hill country, a restaurant with magnificent views, and a pool with a cool small rock jacuzzi. And the rates are very reasonable. The restaurant serves a very good continental breakfast during the week and a full breakfast on the weekends. The pastries on the continental breakfast were out of this world. Canyon of the Eagles is fortunate to have a gourmet chief, Chief Larry Webber, who was the chief at some 4 star well known restaurants from New York to Mexico. For dinner, we had the Mahi Mahi with a wonderful teriyaki sauce, sauteed vegetables in a peanut sauce, and rice plus an outstanding huge prime rib cooked to perfection. The other items on the menu looked equally enticing and it was hard to make a choice - we hear the pecan crusted chicken is fantastic. After a great breakfast, it was time to explore the property by bike and then hike some of the 14 miles of trails which wind though the property. One of the trails, the Bird & Butterfly Trial, is a self guided and level bird watching trail made of crushed stone. The other trails vary in terrain and difficulty and can lead you to the lake for a refreshing dip or to the top of a mountain with 360 degree panoramic views. After the hike it was time to cool off in the pool. Their pool and jacuzzi are fantastic and you could spend quite a few hours here. 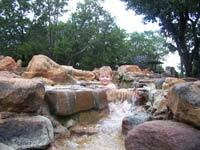 The Jacuzzi is all stone and has a cascading waterfall into the pool - it wasn't easy to get the grandson out of here. Some of the other fun things to do at Canyon of the Eagles include: fish from the bank or either of the two piers; volleyball down by the lake; spend some time at the observatory; rent a canoe or kayak from Lake Buchanan Adventures and kayak to the falls; enjoy the nature programs, live music, or other special events; lunch at Bedrock Beach Grill on the lake; or take a Vanishing Texas River Cruise on Lake Buchanan. 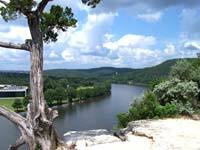 Canyon of the Eagles is a great place to spend a weekend with friends or family. The staff is outstanding (everyone seems to truly enjoy their job) and they will go out of their way to may sure your stay is memorable. You can read our review to learn more about Canyon of the Eagles. You need to book early, they stay busy. It is a fantastic place for corporate retreats, reunions, or weddings. 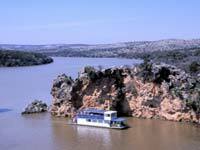 Our review of Lake Buchanan will tell you more about the lake and what else there is to do in the area. The next morning, we went in search of the best Migas in Austin and all the reports pointed us to Maudies. And we weren't disappointed, the Migas were outstanding, the salsa had a nice bite, the breakfast tacos were perfect, and the french toast was excellent. And you can't beat the spicy Bloody Marys. I don't know why, but we do this every time - stuff ourselves on great food, then feel guilty about it and need to find some way to try to exercise some of it off the body. So this time, we took a very short and easy hike (you try walking up some hills after stuffing yourself with Migas, left over breakfast tacos, french toast, pancakes, and a couple Bloody Marys!) to the bluff above the 360 bridge over Lake Austin. Wow, what a panoramic view of a fantastic and fun lake and city. 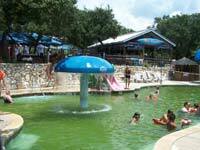 From there we took the grandson to Volente Beach Waterpark on the shores of beautiful Lake Travis. 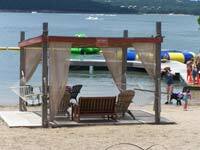 Volente Beach has four different water slides, two kids pools, two places to eat (surprisingly good food) and drink (excellent Bloody Mary and a pretty good margarita), beach volleyball, three different reserveable picnic or party areas, and 100 yards of beach front on Lake Travis with a trampoline, roped off swimming area, kayak and paddleboat rentals. 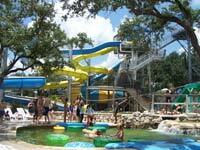 Volente Beach is a fun place to spend a few hours - kids and adults will enjoy this waterpark. A quick change of clothes and we were off to Brentwood Tavern in north Austin for some food and live music on the patio. The Brentwood Tavern has western decor, rustic furniture, a tree shaded patio with a stage, and a kid's playground. Unfortunately, because of the rain, the outdoor music was canceled. So after some good food, a quick check of the Austin Observer for other music venues, we headed toward the Oasis on Lake Travis. Half way there, we called and found out they were closed due to rain - darn the bad luck. Headed to our daughter's house to play some cribbage and other games. Sunday it was off to bike around Town Lake which has an excellent mostly flat and easy, but very scenic trail around Town Lake. 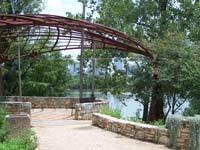 See the biking Town Lake Page for some fun things to do in addition to just biking along the trail. We like to start the trail at the High School and tennis courts on south Ceasar Chavez. On this trip we head south, crossed the bridge, and rode to Aussie's for lunch because we wanted to see if we could get in a pick up game of volleyball. 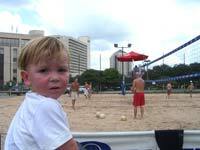 Aussie's was having a two on two tournament, which was fun to watch as we ate some good food. The pineapple burger, wings, and buffalo chicken salad were very good. After completing the rest of the Town Lake Trail we wanted to cool off in the Blue Hole in Georgetown which was on the way home. 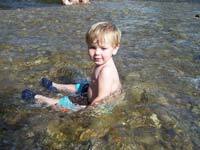 Unfortunately, the Blue Hole was closed due to flood damage, so we stopped at San Gabriel Park to cool off and swim in the San Gabriel River. This is a very nice 80 acre park along the banks of the river and has lots of picnic tables as well as baseball diamonds and a disc golf course. A dam provides a great swimming or fishing hole on either side of it. The water is cool and clear - a nice refresher after a hot sweaty bike ride. 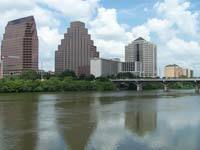 Within the park, there's a new wooded paved 1-mile hike and bike trail that wanders along the North Fork of the San Gabriel River from San Gabriel Park to the new River Park west of I-35. 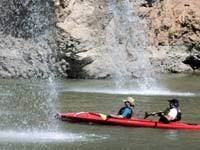 You can also enjoy the popular 3-mile hike and bike trail following the South Fork of the San Gabriel from San Gabriel Park to Blue Hole where a small dam provides good swimming on either side. After a refreshing swim, it was back in the car to head home for another week of work.